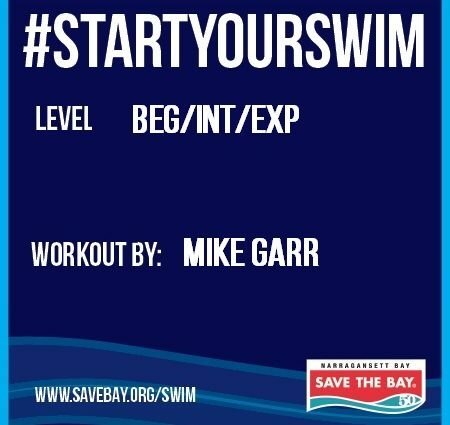 Swimmer does 50 yards for time, counting every stroke. Count total strokes (left and right arms) and add seconds; that’s the swim golf score. So, for example, if you took 50 seconds to complete your 50 yards, and you count 26 strokes (13 strokes per length) your score would be 76. Well-trained, competitive swimmers tend to score well under par (72), and your typical fitness swimmer or triathlete between 80 and 100. The idea of scoring yourself is to see if you can improve your efficiency in swimming. 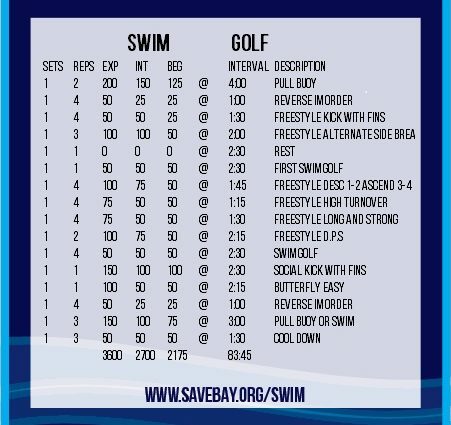 Take the first swim golf as your baseline, and then do the other 4 repeats later in the workout to see if the various freestyle exercises can improve your score and your consistency.